FRGCB - Finnish Retro Game Comparison Blog: TWOFER #9: Pinball Special! Designed and programmed by David Snider for the Apple ][ in 1981. Converted by David Snider and released for the Atari 8-bits in 1982. Converted by Martin Kahn for the Commodore 64 in 1983. Converted by SystemSoft for the NEC PC-8801, PC-9801 and PC-6001/6601 in 1984. Unofficial conversion for the Commodore Plus/4 by Imre Szabo, and released as freeware in 1987. Redesigned and programmed by Glenn Axworthy for the Atari 2600 in 1987, and released by Atari as "Midnight Magic". Designed and programmed by Bruce A. Artwick for the Apple ][, Atari 8-bits, Commodore 64 and IBM-PC compatibles in 1982. Unofficial conversion for the Commodore Plus/4 by Mucsi of Muffbusters in 1990. Before video gaming was even properly invented, or at least brought into the arcades and our homes, pinballs were the main culprits of gulping down young people's hard earned pocket money. Not too long after the home computers became capable of producing some proper graphics, game designers started working on pinball simulators so that you wouldn't need to waste any more money on actual coin-operated pinballs. It would be quite a long while still until the simulated pinballs would become close enough to the real things to make them even half as obsolete as they are supposed to be, but playing a real pinball game is such a physical experience on so many levels that you can never reproduce it in a simulation. That said, any commercial attempt at creating a playable pinball game for our computers in the early days of home gaming was intriguing, and are now surrounded with a thick cloud of nostalgia, much more than any mechanic pinball could do. My introduction to computerized pinball was with Synapse Software's C64-exclusive Slamball, which has a scrolling table and surprisingly realistic physics compared to other pinball simulations of the time. 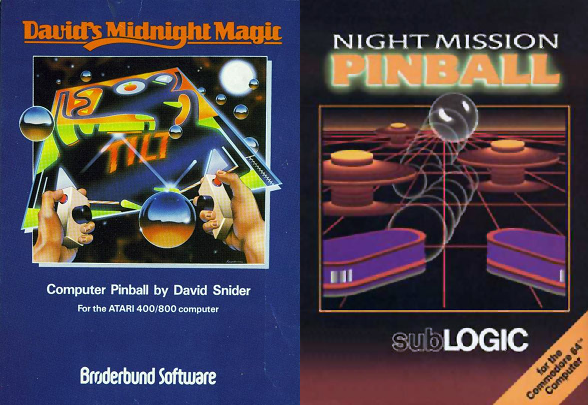 But when it comes to the earliest computerized pinball titles that I consider worth knowing, David's Midnight Magic and Night Mission are the first and foremost that come to mind, which is why I decided to write a comparison of these two games for today's twofer. Both games were originally developed and released on the Apple ][ computers, but unfortunately there are no dedicated websites to offer any fan-based scores, so the scores are taken from MobyGames. In the case of David's Midnight Magic, the Apple version has a score of 4.4 from only 2 votes, so that's not a particularly reliable score. Night Mission's Apple score is 4.2 from 5 votes. From other MobyGames scores, DMM for the Atari 2600 has a score of 4.4 from 3 votes and Night Mission's PC booter version has a score of 3.2 from 13 votes. At Atarimania, the 8-bit Atari version of Night Mission has a 7.5 from 11 votes, while David's Midnight Magic has a 7.4 from 27 votes. At Lemon64, Night Mission has a 7.1 from 44 votes and David's Midnight Magic has a 7.2 from 72 votes. At Plus/4 World, Night Mission has a 6.1 from 9 votes, and David's Midnight Magic has a 8.9 from 19 votes. As for the other conversions out there, I haven't been able to find any reliable scores, so I guess it's time to find out. If you have no idea of what a pinball game is, then I suggest you take a look at this Wikipedia page, for one, and then try to get some hands-on experience. For the rest of you, here's a quick description of what both of the games basically feature. Both David's Midnight Magic and Night Mission feature some simple tasks to complete in order to gain bigger points. At certain score intervals, you are given a bonus life to give you further attempts at getting a high score. Both games are played on one solid screen which shows the full table, the current scores of each player, the number of lives and some other game-specific information. Both games feature often utilised pinball gimmicks, such as score multipliers, lock features, virtual pushing of the table that can cause a TILT, etc. Also, both games can be played by four players per session, if you are able to persuade your friends into a match. Each game does have its own particular features that gives them their own appeal, such as the parameters editing mode in Night Mission and the magnets in David's Midnight Magic. Neither of the games have a completely realistic physics engine, but that's only to be expected from games of this age. 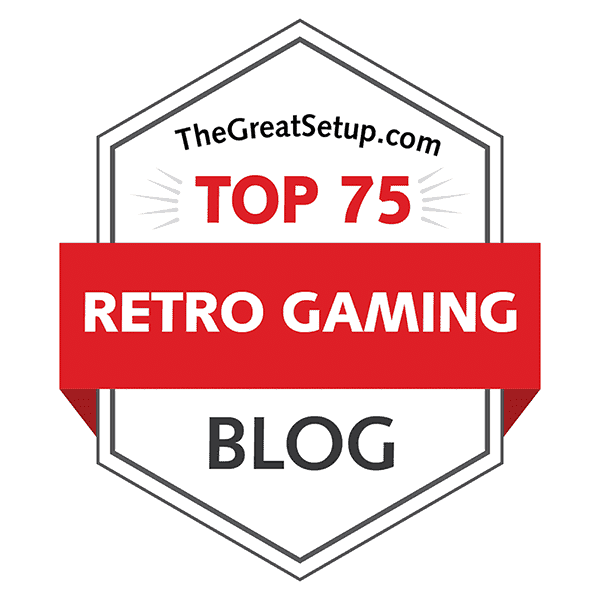 Neither do they offer anything remotely spectacular in today's standards, but for us old enough gamers, they both in their own specific way represent some remote spot in retro gaming heaven, where you're supposed to travel to wearing some sort of rose-tinted glasses. They're both playable enough to at least heavily resemble a proper pinball game, but truthfully, I should imagine them to be considered too primitive to intice too many gamers with modern requirements for realism, particularly where physics are concerned. But remember, these games were released about 33 years ago. As much as I would have liked to make more of a mixture of the two games this time and compare them against each other instead of just sticking to the regular formula, these two clearly are two separate games, and there are bound to be some differences, no matter how similar the concept is. Before going into the differences in playability, you might want to take a look at this document I prepared, which includes all the controls I was able to find out for all the different versions of DMM and Night Mission. But we'll start with DMM here. Back in the day, my only knowledge of the game was learned by my own hand. This, of course, was due to my method of acquiring the game, which was an early turbo tape copy with no modern crack embellishments and ingredients such as a full manual. Therefore, until I started working on this comparison, I was never aware that the game features such unique gameplay elements as magnets. So after about 20 years of playing the game in a certain way, it's difficult to get your head around any new fact. But in the way that I learned to play the game, I still managed to find out that there are quite a few tricks (read: pre-mapped physics quirks) you can learn that can make scoring almost ridiculously easy, such as timing the top right flipper after launch in such a way that the ball will bounce off to the snake-like lock thing at the top left corner of the table. Still, there are many problems with the physics engine in the game that will cause many moments of grief and frustration, particularly if you're not completely awake and alert when playing, because the ball's movement and speed isn't always exactly logical. Also, because the graphics are relatively blocky, the ball will rarely go through passages as easily as is meant to, and instead will hit the blocky passage wall at some point and drop back down with a bigger probability. David's Midnight Magic can almost certainly boast of being one of the first computerized pinball games that actually has a table with ramp passages, ball locks, bonuses and even multiple flippers. But it also happens to be the first computer pinball modeled (more or less) after a real pinball table - this being Williams' Black Knight. DMM features four sets of targets that will reward you with a certain amount of bonus points once each has been completed, one big bumper, one ramp with bonus targets, a multiball lock ramp thing, a score multiplier ramp, a multiball lock switch, two kickers, two left-side flippers, two right-side flippers and one magnet for each side trap. It should be noted, that the Atari 2600 version is a rather different game, although it is certainly a pinball one. It was made and released by Atari as just "Midnight Magic" without any connection to David Snider, as it very well ought to be. For the sake of argument and completeness, I will only include the A2600 version in the comparison as a point of comparison, but it will not be given any scores. It is a surprisingly good game, though, considering the hardware and particularly its graphical capabilities. As for the rest of the lot... well, there isn't much to tell, really. The only really noticable differences in all the versions are the difference in game speed and the controls, the latter of which can be viewed to some detail here. The ATARI and PLUS/4 versions seem to be a bit faster than most of the others, and can be problematic to adjust to if you're too familiar with the less speedy versions. However, the NEC PC-8801 version is even quicker than the previous two - even at 4MHz and PAL speed. So, basically, in order to get as comfortable an experience as possible with DMM, I would suggest you choose either the APPLE ][ version or the C64 version. Mind you, it's next to impossible to find a fully working Apple disk image on the internet that would be able to save your high scores, so in that sense, a good crack of the C64 version is your best option. Still, were you able to get your hands on an original Apple disk, I would recommend that one just as much as the C64 version. Strangely enough, my first, and for a very long time my only experience with Night Mission was on an old IBM-PC with an orange monochrome monitor, and the person who owned the machine probably didn't even know there was anything as interesting and unique about the game as the FIX mode is. Much like with David's Midnight Magic, I only learned of it while writing this entry, so it was never a part of my experience with the game. Even if it were, the comparison would still only be made with consideration to the default mode. Being still a very early computerized pinball game, the physics engine isn't all that much better than it was in David's Midnight Magic - in fact, it could be considered even worse, at least by default. By tweaking the FIX mode parameters, you might get the game a bit more realistic, but that should be a chapter of its own. In fact, you might want to take a look at the original adjustments manual if you're interested enough in dabbling with the FIX mode. But by default, all the bumpers and kickers make the ball bounce around so fast that you will have trouble seeing the ball properly, and sometimes the ball latches onto the surfaces in such a way that it travels on the table in a very unnatural and illogical looking manner. A familiar problem with unsmooth surfaces caused by 8-bit graphics is still very much a problem here, but it has been tried to be kept at a minimum by forcing the ball go through gates and ramps a bit more automatically. Even this solution only works with an unfortunate randomness that makes the game feel more awkward than smooth, but for its time, it was as much a solution as any other. Whereas David's Midnight Magic is based on a real-life pinball machine, Night Mission has no real-life counterpart, and considering some of the ramps and wall angles in the game, it wouldn't really even be possible without some sort of unseen mechanics. Still, it does have some nice ideas that hadn't been utilised in DMM, such as a real use for the striker spring's adjustments, free ball bonus, multi-purpose targets, more elaborately constructed sequential missions, lockable gates and a bumper saver at the bottom of the table between the two flippers. For a complete list of missions and items, take a look at this C64-Wiki page. Released as they were in the very early 1980's, I cannot say that there are any actual differences in most of the versions regarding playability, other than the fact that they were designed for the machines of the time. The only really noticable difference is that the ATARI and APPLE ][ versions don't have the bumper saver thing at the bottom, which makes the game slightly more difficult, and also the Atari version pretty much requires paddles. But otherwise, there is nothing worth mentioning, really. Only the first DOS version is the most difficult of the lot to get to play on a proper speed on a modern computer - even with DOSbox - and that's really a minor problem considering everything. There was a later version released for the DOS, however, which was fixed to be compatible with more modern computers, along with having some graphical enhancements. Other than what's been mentioned already, I would say that all the versions of Night Mission are practically equal when it comes to playability. Whether they are equally available to buy as a physical copy or not is another matter entirely, but this is not something this blog is designed for. One of the reasons I chose to do a comparison of two early pinball games now was because they're not very rich in graphics, and make for a relatively easy twosome. As I'm in a bit of a hurry to get working on the last comparison of the month, I shall be quick about it this time. Loading screens from the Atari 8-bit (left) and NEC PC-8801 (middle + right) versions. Apart from the ATARI and NEC versions, the game offers no particular intro or loading screen. Even in their cases, it's hardly necessary, but a loading screen in the early 80's had a tendency to give a game some particular sort of gravitas, I suppose. Fans of more modern computer pinball games might well be shocked to see a pinball game as old as this, since it offers very little decorations. The table has been clearly split into two sections with two rather strange choices of colours. The only really decorative items here are the diagonal ramps leading to the bottom flippers, the apple on the top bumper and the triangular shapes in the top section. There are no background graphics, but then there aren't too many other 8-bit pinball games that would have such - at the time, this was state-of-the-art. There are some animations and "special" effects that are shown on certain occasions, such as when the magnets are activated, there will be animated arrows pointing at them, the apple bumper will flash black on every bump, and the kickers change colours every time the ball hits them. Since the Apple ][ isn't a very capable machine when it comes to coloured graphics, it's plain to see that there's a low quality sort of an overlay of colours on top of a high resolution white monochrome background. Indeed, the game looks slightly more at home on a monochrome display than with colours. But only slightly. Screenshots from three different Atari 8-bit versions. Strangely enough, the official ATARI version was only ever released with monochrome graphics. First, the Broderbund version was a strictly black-and-white affair. A few years later, Atari re-released the game with new "enhanced" graphics, which was still monochrome, but now with green instead of white, and the Atari logo on the bumper instead of an apple. Since the original was released on a disk, it had a loading screen to go with it, as you saw above, but the Atari re-release was a cartridge-only release, so it went straight into the game. Unless you're perfectly happy with the monochrome graphics, a more colourful Atari version would have to be sought out elsewhere - a fan-made modification called "David's Midnight Magic 2" adds some sorely needed colour into the game. At least to my knowledge, the C64 version doesn't have a monochrome mode. Not that it would really need one. If you had a black-and-white TV or a monitor, you'd have your greyscale mode right there. But pinballs are supposed to be colourful, aren't they? Although you won't necessarily really see it right away, there is some inferiority here regarding the number and usage of colours when compared to the APPLE version - you can see it in the diagonal ramps leading to the bottom flippers. It's really a minor complaint, considering the official ATARI versions don't even have colours, and the unofficial version has only as much colour as the C64 version. Screenshots from the unofficial Commodore Plus/4 version. The unofficial PLUS/4 version seems to be only a slightly paled copy of the C64 version palette. Although the colour scheme feels notably lighter than on the C64 version, the PLUS/4 has a larger selection of colours in its palette, so the result is really only a matter of choice. Otherwise, the graphics are pretty much as good as they should be. As a curious little bonus, the ball has two optional sizes, neither of which are exactly the same as on the C64, but rather a slightly bigger one and a slightly smaller one. I have no idea whether this has any effect on the game, even though I tested it quite thoroughly. The ball does flicker a bit on the move, so I would have imagined that the size reduction was done to reduce the amount of flickering, but that wasn't it - so it remains a mystery to me. The only other notable problem is with the TILT tag, which has a bit of green on both ends of the underline, but that's just nitpicking. Of course, one might have an opinion about the brown high score list, but it's just an opinion. Anyway, however good the conversion is to play, it's not quite perfectly optimized for the hardware. Screenshots from the NEC PC-8801 version. Happily, there is at least some effort to be found in one of the conversions. Not only does the NEC PC-8801 version have more colour (at least shades), it has two completely unique fonts for the high score list and for the player indicator. Also, the pinball table looks clearly more hi-res throughout, even though there still are some bits here and there that feel like leftovers from the APPLE original. The only thing SystemSoft forgot in the conversion was that the kickers should change colours on every hit, now they just show the kickers come out on impact. But overall this conversion still looks a fair bit better than any of the others. Too bad the game is almost impossibly fast. There are also conversions available for the NEC PC-9801 and PC-6001/6601, the first of which I couldn't find any footage, screenshots or game images anywhere, and the latter of which I could only find from YouTube. It looks like an awkwardly coloured version of the C64 conversion, but as such, it should be more playable than the PC-88 version. Screenshots from Atari 2600's Midnight Magic. As you can see, the ATARI 2600 version looks nothing like David's Midnight Magic, and instead has a very much more old-school approach to pinball games in almost every way. For an A2600 pinball game, it still looks rather nice, but it's not DMM, not even close. Now that this has been dealt with as far as necessary, there is no need to mention it in the Sounds comparison section. To be honest, I have no idea whether the speed of the game on any computer has anything to do with the hardware capabilities, so I cannot comment on that. But I do think the APPLE, C64 and PLUS/4 versions are the most comfortable to play, whatever the reason. Still, the PC-88 version beats the lot with its graphics, there's just no other way to put it. And since the official ATARI versions are only monochrome, it shall have to settle for the last place here. DOS v.1 (bottom left) and DOS v.3 (bottom right). We start this one with a curiosity. The C64 version seems to have what I suppose is a loading screen, although I have yet to find out, which version includes it. Being made entirely from basic graphics characters, it certainly shows the game's age more than adequately, although at the time, it was a novelty to have one at all. Although the screen is exclusive for the C64, I cannot even consider giving it any sort of advantage - not only due to the quality, but also because I am not entirely sure if it indeed exists in any of the original releases. Also, apart from the graphics mode menus on the DOS releases, the two COMMODORE versions are the only ones to feature an additional title screen with a menu to allow you to view the full instructions, start the game in a demonstration mode or a regular game mode. It's nothing much to see in any case. When you start the APPLE version, the game is automatically loaded into whatever your display format is, but if you want to, you can change the screen mode between multicolour and monochrome. Naturally, the multicolour mode looks a bit muddled, while the monochrome looks crystal clear, and the latter is really the preferred option here. Still, it could be worse. The screenshots for the FIX mode have been added only for completion's sake - it offers no actual graphics in any version, but I know there are some font fetishists out there that might want to have their options known. As I mentioned earlier, both the ATARI and APPLE versions are the only ones that don't have the middle saver bumper at the bottom. Apart from having a blank spot in its place, it affects the graphics in no other way. Anyway, the ATARI version is the first one of the lot to offer a modifiable multicolour mode. Unfortunately, however you modify the colours, it will always look hideous compared to the original hi-res monochrome graphics, which actually look even slightly better here than on the APPLE ][. You can also change the border colour in the monochrome hi-res mode, so that's a nice feature in a way, although the bad thing about it is that the colour changes with the same controls as you control the striker. The C64 version is the only one in which you are able to change the monochrome colours, which makes for a great alternative for the repeatedly horrible lo-res multicolour mode. Here, at least, you are given a new set of keys for modifying all the colours. As such, the C64 version offers the most comfortable means for modification, as well as the best options. Although the PLUS/4 conversion was made to be as close to the C64 version as possible, the colour modding options were left out, and all you get is a pink-and-black monochrome hi-res mode. It's alright, since it works for this game, but unfortunately, there's a bit of flickering going on here that takes away from the little fluidity that the game might have had. Screenshots from the two DOS versions. The most colourful one is taken from v3. I know it may sound a bit partial, but the truth is, even without any in-game colour mode options, the first DOS version looks the most comfortable as it is. The 1982 release offers four screen modes, which feature at least three different colour schemes. I'm not entirely sure about the first of four modes, because it looks the same in DOSbox as the basic CGA mode. The 2nd CGA mode features just as many colours as the first, only the colours are different, and then the black-and-white mode can only be played with a designated monitor. Of course, the APPLE version had the best multicolour mode at the time, even as bad as it was, but the DOS version offered the best options for that with the hi-res four-colour modes. It could be argued that the DOS-exclusive 3rd edition of the game from 1988 can't be counted as one of the group, but that's just balderdash. Bruce Artwick enhanced the game, because he was able to, and the game is still exactly the same as the original - it just takes advantage of the new hardware to make the gameplay experience more complete with all the colours that it was probably supposed to have in the first place. Even just in the 16-colour EGA mode, it already looks the best it ever did. All of the versions of David's Midnight Magic have pretty much exactly the same set of sound effects. The original was made for the APPLE ][, which and the conversions follow the original's bleepy style. Only the pitch and speed are varied accordingly to the conversion's gameplay speed, so the APPLE and C64 versions are relatively slow compared to the NEC version, and the other two fall in the middle. As such, I don't think any of them could be considered better than the other. Uniquely, though, only the ATARI version has any music at all, and even that is played during the loading screen, before the actual game is loaded in. So, although I wouldn't normally consider this sort of a thing part of the actual game, I suppose I could make an exception this time, because it is an exclusive thing. 2. All the rest of them. This one is more constant in its non-offering of music than the other game. Happily, though, there are some differences in the sound effects department. The sound effects are made to mostly resemble fighter plane noises, such as engines, machine guns and bombs - that is common between all the versions. However, while most of the versions play the effects from each machine's internal speaker (yes, even the ATARI utilises POKEY here), and due to this, sound very much the same, the two COMMODORE versions utilise their own specific sound chips to create something similar, but different enough to warrant closer inspection. Also, the 1988 DOS version has some new sounds, but the only version I have found from the internet seems to be slightly corrupt, and it sounds supremely horrible. Until someone can prove that this is correct or wrong, I will not give it a separate score - not that it would matter all that much. Compared to all the others so far, the C64 version feels like a breath of fresh air. Not only does it offer cleaner effects, but they are also more fitting for the theme than the noisy rattles that the other versions make. On top of that, the overall feel of the game's sounds has a nicely contained quality to it, as if you were hearing the sounds coming from an actual pinball cabinet instead of finely tuned speakers. Easily the best of the lot. The PLUS/4 version has the noise level and quality closer to the original, but there are less sounds and the noise is more constant and feels a bit non-specific. Honestly, the two Commodores are almost polar opposites of each other in this case. As much as pinball games are supposed to be coffee break fun at best, the only thing these games are good at anymore is nostalgia. Night Mission pioneered the genre in modifiability, but DMM only presented an option to Bill Budge's Raster Blaster from 1981. At least DMM was converted for several machines, while Raster Blaster was only ever made for the APPLE ][, so for us non-Apple fans, DMM was the first proper choice for a computerized pinball. Of course, in 1983, Bill Budge's Pinball Construction Set (Apple ][, Atari 8-bit, C64, Macintosh, DOS) made every other pinball game so far practically obsolete at the time. Now, though, all of them offer a glimpse into a colourful programming history, and a few minutes of fun and frustration at a time. Well, you know the drill. If it doesn't look right, there's something wrong with the mathematics. I'd say the Atari version should swap places with the NEC version, but otherwise I'm fine with the results. David's Midnight Magic is a good example of an early pinball game, no matter which platform you're playing it on, but you have to adjust yourself to each version's speed in order to enjoy it. If you're not completely happy with any of them, you can always download Visual Pinball and grab the 2005 remake of the DMM table to go with it. I can't say it's any more visually pleasing than the original, but at least the physics should be more realistic. I would like to remind you, that the reason why the Playability scores for the Apple and Atari versions is lower than for the others is simply that they are missing the bumper from between the bottom flippers. Otherwise, they are all equally playable, and because of that, I can easily recommend you to try any of them, if you have never had the chance to do so. Unfortunately, this game has no modern remake anywhere, so the only way to go is retro.